The ISIS URANIA Coven, formed in 1960, now has daughter and granddaughter covens practicing across Canada. Our members are serious and dedicated followers of the Old Religion, skilled in the Ancient Art. These Covens send powerful healing vibrations (FREE OF CHARGE AND OBLIGATION) to all those in need, every FULL MOON and NEW MOON at exactly MIDNIGHT at your local time. If you have a health problem, be it physical, emotional or mental, tune in at the above time for 15 minutes. Sit in a relaxed posture and in a peaceful, receptive state of mind while visualizing in your mind’s eye the image of the High Priestess Tarot card. Should this image be too complex and/or difficult for you then simply visualize the image of the Full Moon. Please, DO NOT OMIT THE VISUALIZATION as the symbol is our transmitting channel. Also, if you would like to help a sick animal, you can sit with them while performing the meditation. 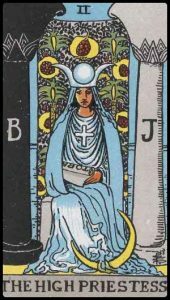 The image of the High Priestess Tarot Card forms a link between those who perform the meditation, and the healing energies and prayers sent by the Isis Urania lineage. Many miraculous things have happened for people who use this meditation, as it connects them with this very real source of healing power that works far beyond the reaches of what the intellect can admit as possibility. More importantly this meditation brings those who perform it into contact with the Goddess, worshipped throughout history as the Compassionate One who always responds to the needs of those who call on her out of Devotion and Love. Not only does she heal beings in the relative sense where we encounter common physical, mental and emotional illnesses–she also responds to beings on the very deepest level of who they are, leading them to an understanding of the Wisdom and Love which has always been part of them.